It’s raining, it’s before 8:00 a.m., and I’m eating cookies for breakfast. But these aren’t just any cookies: they’re made without egg, so they’re almost more like pumpkin drop biscuits. They’re amazing with hot coffee and the latest episode of Dexter. I got back from Jean’s memorial last night and have given myself this day to hunker down a little, do some laundry, nap, hang out with the dogs, read, watch movies…whatever. Since my folks moved to the Bay Area when I left for college, I don’t go back to my hometown for holidays–or for much, really. So going back to Eureka is always odd. Sometimes I feel nostalgic walking around the quaint downtown, getting a bagel at Los Bagels, or going to the park. But this trip was, obviously, a different one filled with days that seemed to go on forever, family friends I haven’t seen in fifteen years, and new friends from Boston that Jean loved dearly (and I can see why). So it was mentally exhausting for many reasons. And today I’m just laying low. I do have a few people coming over to potentially purchase my Vespa (cross your fingers! ), but other than that, this could be a stay-in-your-pj’s kind of day. And these are the perfect laying low cookies. They’re easy to whip out, and you probably have most of the ingredients on hand. They’re cakey rather than crispy, and have a nice heft that’s perfect for a rainy day. When my mom makes these, she leaves out the raisins and nuts altogether. I’ve adapted the recipe to include a little dollop of icing on top. They’re perfect this way. Again, feel free to leave it out if you prefer. Preheat oven to 375. In a large bowl, sift together the flour, baking powder, baking soda, cinnamon, salt and sugar. In a medium bowl, mix together the pumpkin, butter, and orange peel. Add the dry ingredients to the pumpkin mixture, and mix until just incorporated. Stir in the raisins and walnuts. Drop dough by tablespoonful onto ungreased baking sheets. Bake 10 minutes, then transfer the cookies to a wire rack to cool completely. To make the icing: stir in 1 tablespoon of heavy cream into the powdered sugar and cinnamon, and slowly add more until you reach a smooth consistency that you like (some people like thicker icing than others). I generally will add a little over 2 tablespoons to a cup of sugar and whisk well. Ice the cookies when they are cooled completely. The icing will dry nicely on top. These have a rustic look, so don’t worry about being precise with the icing or the shape of the cookie. These look fantastic! 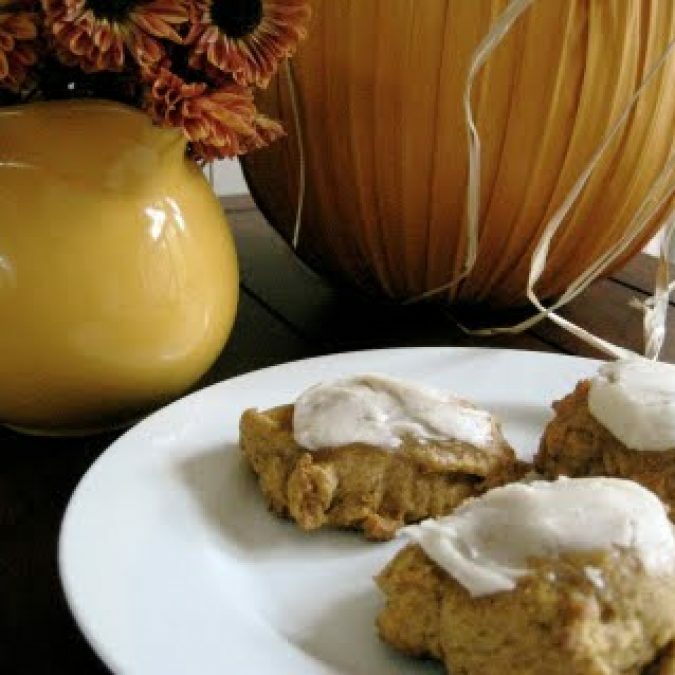 I've been really into pumpkin lately and just made pumpkin cookies with brown butter icing - yum! For all of those out there watching your waistline; these are the cookies for you! I did some caloric research recently (as these are also my FAVORITE fall treat made by our mom!) and they are surprisingly low in fat and high in fiber! I have also been playing around with substituting the butter with homemade chunky apple sauce and it tastes GREAT and makes the cookies even lower fat/calorie! Eat as many as you want and don't feel ANY guilt! Thanks Meg! Kelsey: brown butter icing certainly sounds amazing. I'll get on over to your site to check that out...And Rachael, love the idea of making these with applesauce. I think you're right--you wouldn't even miss the butter! Delicious sounding cookies and very seasonal! Glad you're getting to lay low for a bit and regroup - sounds like you need it. I made your cookies today and plan on enjoying them for breakfast tomorrow with coffee. Tomorrow is a day off from school for my children. We may not get out of our jammies if the rain and winds continue. YAY! I'd love to hear what you think...it's been strangely humid here lately, so this particular batch turned out quite moist--a little more than desired, actually. They're perfect for breakfast. Enjoy. Just finished my coffee and cookies, an excellent breakfast treat! We're all still in jammies, it's cold and rainy outside, we may not even get dressed. I love a rainy day!! Oh I'm so glad you enjoyed them! Fantastic! They have a scone-like look to them. Love any cookie I can justify eating for breakfast. And, from a New England cookbook...wonderful. Wow. That's a perfect frosting for those cookies! I"ll leave the recipe the way it is. Looks delicious. Hopefully rain here tomorrow- it may end this 90° weather in S. Florida. I'm sort of on a pumpkin kick these days, and these cookies are even more inspiration. They look so delectable! A little early for pumpkin and maybe I'm a little late on the post but I need to make these this weekend, sans raisins. Los Bagels - I remember speeding up to Arcata (from McKinleyville High) at lunch to grab a bagel with cream cheese, dripping with Larrupin sauce. I have yet to find a bagel that tasted that good, though I think it has more to do with that galvanized teenaged hunger than the current availability of a proper bagel. Still. I made these with fresh sweet potato and added allspice. They are delicious! A perfect fall treat!